darkSpyro - Spyro and Skylanders Forum - Spyro the Dragon - How hard is Gnasty Gnorc?? darkSpyro - Spyro and Skylanders Forum > Spyro the Dragon > How hard is Gnasty Gnorc?? Nearing the end of the game yay! In the last world now. How hard is the actual boss level? OH GREEEAT, another disappointment like the 2nd round with the Sorceress! Too simple for a final showdown in my view. Gnasty Gnorc doesn't really feel like a boss level, it just feels like an ordinary level, kind of like the other mini boss levels did. That's one of the bad things about this game is that the boss levels kind of lacked, although Metal Head is a pretty good one, probably the best one out of them all in this game. Doctor Shemp is alright too. On scale of 1 - 10 it be a 1 or lower. It really makes me glad that Insomniac decided to totally revamp the bosses in the sequels. It really makes me glad that Insomniac decided totally revamp the bosses in the sequels. They are all lieing to you!!!! Don't believe them, you don't simple charge him, you have to roast him slowly over a fire. It is very hard, very frustrating, I died like 100x0 times, no one has beaten him! Jk: it's like sorting sand down to a single grain, just takes some looking around, there are bosses harder than him, like Metal Head, I hate that guy. I don't think Metal Head is difficult to beat, just more challenging and entertaining than the others, it just feels more like a boss. AND YOU GET TO BEAT HIM LIKE A BOSS TOO. Another thing I don't like: You don't have to fight the bosses before entering another world. I didn't do Jaques or Metal Head. The only final boss who's easier is Bowser in his debut. I agree with you, I've never known another game where you don't have to defeat the boss to get to the next higher stage later on in the game. This just makes it a little bit too easy. Most of this game is quite easy, but I find it quite fun and relaxing to play. The other two are definitely more challenging. I say that Gnasty is the 2nd easiest boss along with Toasty. He really isn't difficult, you can easily beat him in one try. I didn't find him difficult. he looks easy but on youtube people say he's really difficult? Easiset boss in the world. 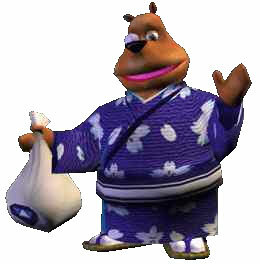 Easiest in the Spyro universe, in my opinion. I was talking about the boss. You just have to follow him and flame him... Not hard. Gnasty Gnorc is, as said before in this topic, quite simple and easy opponent/boss fight. It is just basic hit-and-run-style combat with nothing complex. But there is one thing that one should do in this battle, especially when you're going for the 100 % run. Remember to collect all the gems! I use the strategy of collecting every bit of treasure in the boss battle level before chasing the thiefs and hitting Gnasty. But all in all very simple fight... just collect the gems. "I had a feeling I saw a girl in a sailor uniform with a machine gun walk by..."
I beat him in about a minute. I think Metal Head was a LOT tougher for some reason. I hear he was a lot tougher in some of the beta versions, and that they really made him much easier. Shame. It's been so long since I played Spyro the dragon, but I remember Jacques was the one that gave me most trouble when I was a kid. Gnasty Gnorc I actually found kind of easy. ^ Yup and yup. Jacques wasn't the hardest one, but certainly most annoying. Really? You think his attacks are difficult to dodge? Wow. You know you can make Spyro roll out of the way? Even though this is far beyond already answered, I would say that Gnasty Gnorc is pretty easy if you have already played the game already to him. The only thing I found difficult was flying platform to platform in the last part without falling at the last platform. I could never beat him when I was younger. But Metalhead was always my favorite. I don't think the boss was hard. He was just annoying. Mainly because if u die, u have to chase those 2 theives again. ^Ohh I didn't think it in that way, Good Point!! Not even close to hard. I beat that game about 50 times already. I play that game over and over. It's my favorite Spyro video game of all-time!